Everything Depends on Frame of Reference - Fact or Myth? Everything we perceive or measure is dependent on our frame of reference, and relative to other reference frames. 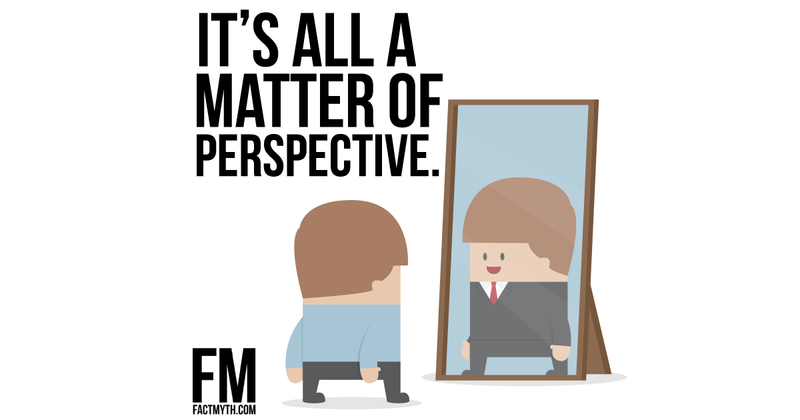 Everything we perceive depends on our frame of reference. What we observe is relative to our point of view. In other words, “it is all a matter of perspective”. Without a frame of reference in spacetime, we can’t tell what object is moving, if time is passing, or the order of cause and effect relationships. Without some sort of cognitive frame, we can’t even know “I think therefore I am” (for this requires a frame of cognition). No matter what field we are discussing, “a frame” is needed to orient one’s self. Skateboarding Frame of Reference Demonstration. Frame of reference are hard to grasp if you jump in physics first (cognitive frames are easier). That said, this fun and simple explainer video will help you wrap your head around relativity and reference frames. TIP: This page describes all types of frames. If you already know what a reference frame is, and just want a better explainer of frames in physics, check out our page on simple reference frame examples (physics). A frame of reference is a point of view, or the lens through which we see things. It can be described as perspective, context, criteria, or a set of values (or coordinates). To measure or perceive anything, we must orient to a reference frame (true in physics, as it is in the social sciences, as it is in math, as it is in cognition). Given this, one could say, “everything we perceive is dependent on the frame of reference and relative to other reference frames”. TIP: In physics the words measure, perceive, and observe are often synonymous. They are all done with instruments, rather than the naked eye. Frames of reference mean slightly different things in physics, math, and the social sciences, but generally, a reference frame is always simply “a point of view.” The most familiar reference frame for you would be, you. Everything you know, and everything you perceive, from your point of view, is your frame of reference. Specifically, reference frames work like this in social sciences, physics, and math. In the social sciences, a reference frame is a point of view of an individual or group (a perspective in context). Ex. From the frame of 33-year-old tech guy, I find Mark Zuckerberg admirable. In math, a reference frame is a set of numeric values in relation to which measurements or judgments can be made. Mathematical reference frames are almost always applied to physics when discussed in popular science. For example, defining variables or physical coordinates on paper. A reference frame can be a single point (like your point of view in the blackness of space) or more complex coordinates in spacetime (like three dimensions of space and one dimension of time). Or, in the social sciences, it can simply be a mindset based on past experience, hardwiring, ideas, biases, etc. Let’s break down some general types of reference frames. Inertial reference frames: moving at a constant velocity to an object as an observer. Useful in physics as “the laws of physics are the same in all inertial frames”. 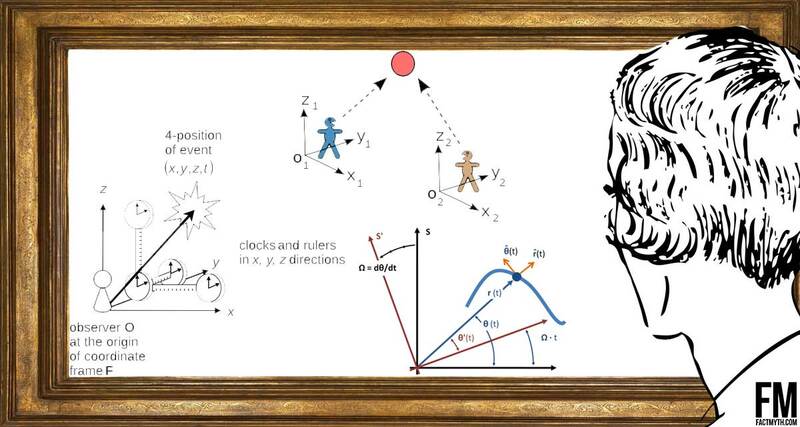 Galileo was the first to describe an inertial frame, this was later adopted by Newton, and then expanded on with Einstein, who considered frames (including non-inertial frames) in reference to special and general relativity with a more modern lens. Non-inertial accelerated reference frames: moving at an accelerated velocity relative to an object as an observer. Also useful in physics when dealing with relativity. Points of reference in spacetime: Physical coordinates in space and time. A stationary frame of observation. Can be a single point or one or more points (this means we can look at a frame of time, a frame of space, or a mix). Coordinates are central to math and useful in physics. Cognitive and Social frames: A frame within which something can be experienced and perceived (including bias, experience, and mindset in general). Everything you know, and your senses, is your reference frame for understanding and perceiving experiences. If we consider something like a website or game, everything happening in that environment is framed in the context of that entity. If we apply this to groups, the frame is the shared psychology of the group. TIP: A reference frame is a window to look out of. Like a reel-to-reel movie where every “frame” captures a moment in space and time, except a frame can be a single dimension or include a large chunk of time and space. Why are Reference Frames Important? We can’t measure or perceive anything without a set of guidelines with which to measure or view it against first. Almost everything is relative to a frame of reference (true for physics, social science, math, and more). All things in the physical universe happen relative to each other, the speed of light, spacetime, and other universal constants. From different frames, we will measure interactions differently, but we can compare relative frames and constants to paint a clear picture of causality. With reference frames, “the observer” describes “the act of looking through a specific frame of reference”. To the observer (from the observer’s specific frame of reference) the person not on the train appears to be moving. Importantly in physics there are two types of frames talked about a lot. The first is an inertial frame, which is a stationary or “fixed” frame like that on earth, or a frame moving with a relative non-accelerating speed. The laws of physics are the same in all frames of relative rest. The second is an accelerated frame, which is a frame that is moving away from what is being observed. This would be like viewing something from moving train, special relativity comes into play when we accelerate, and that affects our perceptions and measurements. Inertial frames are simple; accelerated frames are much trickier. They are the primary reason anyone would look up the term “reference frame”. I suggest this educational video from the 60’s that explains reference frames in physics. Frames of Reference (1960) Educational Film. In simple terms, you can’t accurately judge something until you have something to compare it to. Things are relative to each other. So to find truth we need reference frames we can compare with constants and limits. Frames can be understood by understanding relativity (the idea that motion, time, and space are relative to the reference frame of “the observer”). With inertial frames, like we have on earth, Newtons’ F=ma is used to measure mass. Life is easy. In accelerated non-inertial frames, Einstein’s E=mc2 shows us that energy acts as mass at high speeds. The extra mass from speed distorts time and space and requires us to “calibrate” our measurements to accurately measure the mass of an object (we can’t just use F=ma alone, due to relativity and our frame of frame). If we start comparing reference frames and want to find out what is happening in another frame, the mental gymnastics get even more complex. Given these facts, it makes understanding references frames extra important from a physics point of view. The concept of reference frames is analogous (≃) to other areas of life. For instance, from a neurological, cognitive, and social science perspective, our hard-wiring ideas, biases, and other cognitive processes “frame” how we perceive the world. Thinking of frames and perception in a broader sense, we get an idea of how the concept might apply to other areas of life. One “frames” an argument, watching a certain channel “frames” an interview, wearing a suit frames the way you are treated, your background frames your views of others, etc. Perception is central to the concept of frames of reference. From the a social science view, we can use the concept of reference frames to better understand our decision-making and social interactions. Phrases like “rose colored glasses”, how favorite sports teams and political affiliations affect behavior, and much more all strongly hint that experiences shape our perception of our world and “color” our point of view. In fact, in the social sciences “biases” (our primary tool of cognition) can be considered a type of reference frame. Whether we think of the neurological, biological, physical, physiological, or philosophical aspects of it, the concept of frame of reference works over and over in any example. Descartes, who brought us the Cartesian coordinate system and analytical geometry, said, “I think therefore I am.” In other words, all we know from our perspective is what we think. It is the most basic cognitive frame of reference. Despite the pondering on what we really know and the relative nature of the universe, math and physics help us paint a clear version of what is happening using limits and experimentation. THOUGHTS: ∼,≈,≃,≅ are all used to denote binary relations concerned with approximate or exact equivalence. All systems are generally analogous, one way this is true is that all systems can only be viewed through a reference frame. I think we have made the point that the phrase, “it’s all a matter of perspective” or the nerdy version, “everything is relative to a frame of reference,” is true. At this point, we can talk about Cartesian coordinates, Galilean Relativity, Newton’s laws of physics, Einstein’s relativity and accelerated reference frames, or just take an eight year long master course in physics or the social sciences. We don’t do any of that on this page, but you can check out two non-math and non-technical examples of reference frames here or check out the other pages on our site for more awesome articles. Everything within “the bounds” of the universe is relative aside from a few universal limits and laws. If we take those constants and apply them to math and physics we can get a measure of what is actually happening in the universe. If we apply this concept to everything else we experince, we can start to see how this logic applies to all systems outside of physics. One could say everything is just systems following a basic set of rules, but you know, it’s a matter of perspective. My analysis of “motion” started with absolute Space and Time, and the motion that goes on within this absolute space and time environment. The outcome of this analysis was an independent discovery of Special Relativity(SR). I also independently derived all of the SR equations, including the Lorentz transformation equations. The method in which I derived these equations involved a simple geometry which included the simultaneous stacking of both “motion vectors” and “length scalars”. “Absolute Motion” that is ongoing within an “Absolute Space-Time” environment, produces the outcome of the SR phenomena. However, as SR predicts, absolutes such as absolute motion, absolute rest, etc, can not be detected. As a consequence of this, these absolutes are completely ignored, thus the absolute foundation of which SR resides within, is not taught in schools at all.﻿ The end result is that there is a true necessary confinement to frames of reference, rather than look at the bigger picture. An interesting take on things. Thanks for sharing.